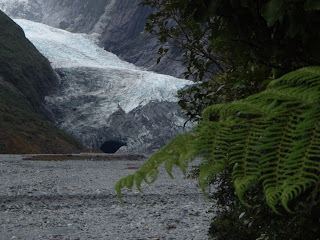 This past week, after a few days of recooperating in Wanaka, I headed up the west coast, by the Franz Joseph Glacier(great article, picture on the right with the fern) and Fox Glacier. While they're not that amazing in themselves, as Glaciers go, they are unique in that they directly border rainforest. This is possible due to the almost constant rain that the west coast of NZ gets. As the Wikipedia articles (linked above note), Fox glacier sits only 300 meters above sea level at its lowest point (the terminal face that I went to). Other tourists were getting helicoptered up into the clouds and walked around on the glacier. Since you can't see anything up there, and I had been walking on ice with crampons for free in the past few days, I decided to save my $200. And now here it is, from Fox Glacier, your "Places Not to Fall Down, Episode 3." Hi there, we enjoy the interesting pics of New Zealand & especially like your Places not to fall down we would enjoy to see more of them. Yeah, so I'll try and keep them coming! Also might try and start a series called "Serious places to take naps" but that one might put people to sleep.